Here’s Looking at You, Kid! | Choose Your Energy: Change Your Life! Ever get discouraged and feel like you just can’t count on others? You’re not alone. It’s very common for us to look outside ourselves for approval, acceptance and love. It’s equally common to discover that what we seek can’t be found outside ourselves. What we are seeking is only found by looking within. It all starts with you—your relationship with yourself. When you are an unconditionally loving and affirming friend to yourself—NO MATTER WHAT—you foster strong self-esteem. External validation is nice to receive, but it can’t be depended on and often doesn’t last. The only thing you can control in this life is your response to it. However you may be choosing to show up at the moment—calm as the proverbial cucumber or in the grips of a grand mal emotional meltdown—bolster your self-esteem by always responding to yourself with unconditional love, respect, curiosity, compassion and gratitude. What are you good at? Look yourself in the mirror each morning and tell yourself, OUT LOUD, one thing that makes you distinctly and delightfully who you are. Then affirm and acknowledge your uniqueness with unconditional love and total acceptance. Whatever your circumstances, you are a unique cocreative expression of the Divine. How could that ever not be enough! Cut yourself a break! Nobody’s perfect—and that’s the good news. The next time things don’t go exactly as you’d planned, instead of beating yourself upside the head with what a mess you always make of things, take a deep breath, give yourself some grace, forgive all involved, appreciate what you’ve learned, detach and move on. Remember, in each moment, Universal love is unfolding the highest good for all, in all, through all. Everything that’s happening, no matter how painful or frustrating it feels, carries within it the seeds of opportunity. Look for the silver lining and leverage the heck out of it! Ban negative talk. That starts with how you talk to yourself and extends out to how you allow others to talk to you. Avoid people who are unkind, ungrateful, critical or unsupportive. Surround yourself with people who love, support and affirm you. You deserve to be appreciated as the delightful expression of the Divine that you are, warts and all. Strong self-esteem is grounded in acknowledging, affirming and accepting ALL of yourself, even the attributes that frustrate you and everyone who knows you. 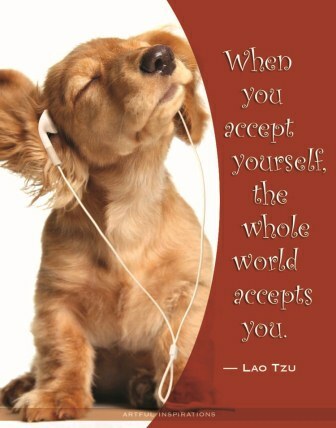 When you practice accepting yourself, the world will take note and follow your lead. When you commit to always nurturing, encouraging and delighting yourself in healthy ways, you help others do so as well. In this way, you become the change you wish to see in your world. This entry was posted in All My Blog Posts, Falling in Love With Yourself, Relationships, Boundaries & Belonging and tagged Deborah Jane Wells, How to love myself, How to love yourself, What are boundaries, What is a healthy relationship, What is belonging, What is self-love. Bookmark the permalink.